My Wife and I like to travel overseas and we both have multiple devices when we travel. Over the years we’ve tried different solutions. From buying ‘travel’ sims before we leave that end up costing a fortune, to just enabling roaming on our phones and again, paying heavily for international data roaming. After doing a little research on the best deal and wanting a flexible option, I bought a 3G dongle from Vodafone. A Huawei K4204 to be precise. My goal is to create a Raspberry Pi that will connect to the hotel WiFi when available and will have it’s own AP running on a different channel so that our devices only have to remember one Access Point. This will circumvent certain hotels that only allow you to connect a single device to their network. It will also mean that if we have a Google Chromecast I only have to program a single network into it and use it when we travel. The Raspberry Pi will have a 3G data connection when no Hotel WiFi is available or we’re out and about. When we arrive at our destination (the UK) we will buy a local sim with local (read: cheap) data. Install Raspbian in any way you prefer. I’ve installed the lite version that has no gui. Check the IP address of the raspberry pi, it should be set to dhcp automatically. At this point you can disconnect the terminal and use SSH to connect to your raspberry device. I used this site as a reference. It was mostly right for me, although I did have to do a lot troubleshooting before I had it completely right. Check the switch by using lsusb, as the output suggests. Bus 001 Device 007: ID 12d1:1590 Huawei Technologies Co., Ltd. 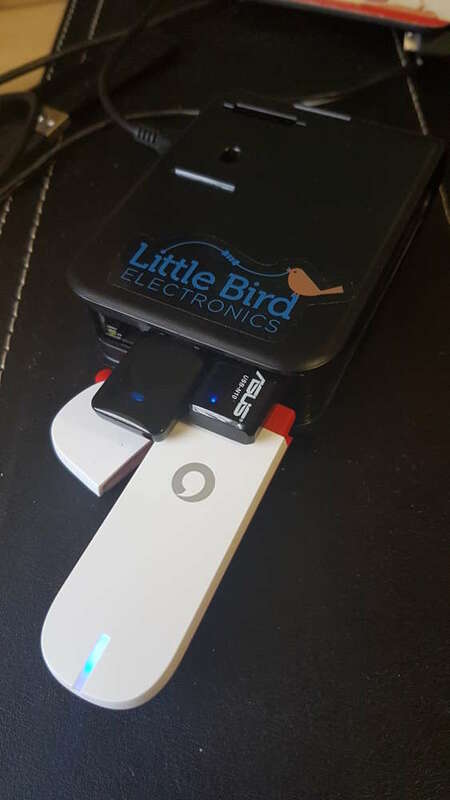 The dongle automagically configures itself and connects to the internet. 🙂 Remember that at this point to connect to the internet will require you to manually set the dongle to the correct mode. PING www.google.com (203.219.197.210) from 192.168.9.100 eth1: 56(84) bytes of data. PING www.google.com (203.219.197.245) from 10.60.204.182 eth0: 56(84) bytes of data. Linux by default does not know that it is a router. We need to enable that functionality and, while we’re there, disable IPv6 (which is something of a security concern). You will need to edit the above to suit. Be sure to check what channels are being used and pick one that does not have too much interference. To explain the above: I’ve gone with a small 10.60.205.128/25 IP range and I’ve set google’s name servers to be my defaults. It is necessary to change eth0’s settings as it will fail to come up when we change some service settings below. It should be safe to start the service now, and test everything be restarting it. if you connect a device to the network it will be able to get an IP address, it just won’t have any internet access. If you have another wifi dongle, as I do, it can also be configured to be a client to another wireless network. This is handy if your hotel only allows one device to be connected to their wifi and you have many devices. Connect the Raspberry Pi to their network and have it do NAT to your devices. The Final Steps: Routing and Firewalling. At this point we can write a simple script called firewall to allow routing. It can be placed in /etc/init.d/. # Don't Touch anything below this line! echo "Firewall: Configuring firewall rules using iptables"
echo "Firewall started and configured"
echo "Shutting down Firewall services"
I’ve noticed that by default the router will route traffic over the wlan1 before eth1, even if eth1 exists and has internet access. This is useful as it means that we can have a single firewall/routing script for both connections. It will fail-over to the 3G dongle when no appropriate WiFi AP can be found. At this point I was able to power down the Raspberry Pi. On coming back online the two dongles didn’t work, but the 3G dongle did. As hotplug is enabled on those two wifi dongles, removing and re-inserting them got them working again. I was then able to connect to the internet (and the Pi) over WiFi. Removing the dongle connecting to my home network immediately failed over to the 3G dongle. Which brings us to the end!